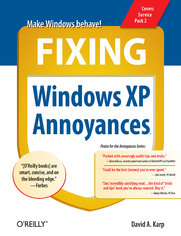 Windows XP is the most popular operating system on the planet--and the most annoying. From incomprehensible error messages to inexplicable crashes, from wonky wireless setups to just finding a file, Windows can make your computing life a nightmare. But thanks to Fixing Windows XP Annoyances, you can banish the bugs, speed up operations, and just make Windows work right. Setup and Hardware-Update Windows, reinstall Windows safely, speed up start up, resolve driver-hardware conflicts, and more. Windows Interface-Navigate quickly, fix screen resolution problems, customize the desktop, and switch applications more quickly. Windows Explorer-Force XP's file &amp; folder management application to remember your view settings, save your default application choices, and get XP's Search tool to behave. Multimedia-Having a problem playing a video or burning a CD? Want to do more with your digital photo collection? We have the answers. Web and Email-Get a handle on spyware, spam and pop-ups; protect your privacy online; learn how to improve your online experience. Wireless and Home Networking-Connect all your PCs; share Internet connections; share files and drives securely; make your wireless network purr; share network printers; and more. If you're having a problem, just look through the Table of Contents for the annoyance that most closely matches your problem, or feel free to start thumbing through the pages. You'll likely find a fix to a problem you didn't even know could be solved. Down with the Picture and Fax Viewer! Whats a Digitally Signed Driver?